RV in the beach parking lot at the bottom of Chapman's Peak Drive in Hout Bay, outside Vida e Caffe at 07h20 ready to start at 07h30. From the beach parking area you run up Chapman’s Peak Drive to East Fort then go off-road. After about 2,5kms of jeep and single track cross the river and run along the contour path towards Chapman's Peak - if you miss this crossing you will go up Blackburn Ravine. Around 3kms of single track running gets you to a junction of paths. Medium Group go straight down to Chapman’s Peak drive and jog on t*r back to cars. 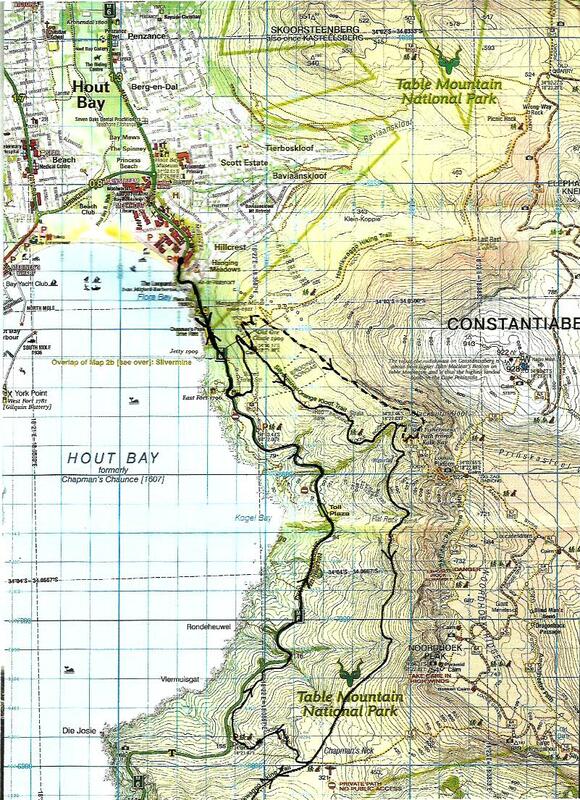 The Fast group may go up to the top of Chapmans Peak if they want a longer run which will add a few kms. The start is along the tarred road for about a kilometer, then we turn off to the left and head up to East Fort. Then mostly single mountainside trail before returning down Chapman’s Peak Drive. Some good climbs off set by spectacular views of Hout Bay harbour and the Sentinel. Some mild exposure. Altogether about 12kms, a good 380m of ascent, which should take more or less 2 hours 15 minutes. In just one day we have a full team (3 cyclists and 3 runners) to challenge the steam train and the makings of another! Marge and Marg can let you know the difficulty of the cycling routes. Please chat to them. Running routes are very do-able. Jo and I can talk about those. The Steam Train Challenge is happening again this year on Saturday 20 October. Last year a trailers team of 3 runners and 3 MTBers took part in the inaugural race against the steam train from Wellington to Ceres - we didn't win, but really enjoyed it. It's great fun, you get to see tiny towns that you normally drive past and spectators can buy tickets and ride on the steam train. Our run tomorrow is ON. From Ou Kaapse Weg turn right at the traffic lights to Kommetjie. 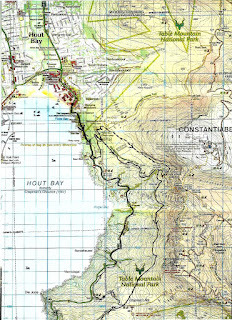 Once in Kommetjie turn right into Lighthouse Road and continue along to the end. From the parking area at Slangkop lighthouse we follow the boardwalk along the beach past the tented camp to the Kom. A short distance along the road and then back onto the beach. Mostly along the beach - distance 14kms which should take between 2 and 2.5 hours. There will be three groups but due to the nature of this run runners may turn at any stage along the route. If you turn back please make sure that you are not running on your own. A whistle, water, a warm & waterproof top, space blanket and ICE tag or card. There are some lovely breakfast spots in the area for a coffee after the run. Our run for tomorrow is ON with a slight deviation to the route. Due to safety concerns follow a recent rockfall on Woody Ravine, we will continue passed Woody to Corridor where we will turn up. This adds an extra 2km approximately. Relaxed group will confirm route in the morning. Fast group will be determined in the morning. RV in the Kloof Neck parking area ready to start at 07:30. Looks to be a chilly start but warming up later in the morning. From Kloof Neck parking we join the Pipe Track which runs above Camps Bay Drive. This is a nice warm-up section with beautiful views down to Camps Bay and toward 12 Apostles, but watch out for those stone trolls which jump out when you're not looking down. Approximately 5km down the track we take a left up Woody Ravine. This is where the climb begins which will get the blood pumping, and with a little bit of scrambling the fun scale is ramped up. After catching our breath at the top, possibly sheltering behind a rock from the cold wind, we head back towards the cable car for approximately 1km with a detour to the viewing point if you wish, until we get to the Kasteelspoort hiking trail to the left. We traverse down Kasteelspoort and at the bottom turn right back along Pipe Track allowing us to stretch our legs on the return to Kloof Neck. Back at the cars we high five and acknowledge how awesome we are. A mix of jeep track, mountain trail and single track. Be warned there are some rocky bits which will test the reflexes and the ankles. Will follow a similar route with an extension to be decided on the day. Slow Group to be confirmed by Friday. *Please note adjustments to the route may be made whilst running depending on the group and weather conditions. Hope to see you on Saturday, have a great week! RV in the upper Kloof Nek parking area at the foot of Tafelberg Rd on your left. Ready to start at 07h30. This coming Saturday we will return to the Tokai Forest which has been opened up again after being closed due to the devastating fire there three years ago. From the Arboretum entrance we will make our way up to the levels and head over towards Vlakkenberg. The exact routes will be decided on Saturday morning as we have a variety of choice. Gravel tracks and trails with some good climbing sections which include the hill "huff n puff" and mostly clear of mountain bikers. Distances about more or less 12Km 10Km and 8km fir Fastgroup, medium "committee" group and Relaxed group.